No snail ever got such artistic treatment. Snails aren't the first thing I think of when I hear "Norway" . . . There was a time when I ordered escargot about once a year, just to say I'd done it. I don't remember how that got started--maybe it was a dare? It was really all about the garlic butter, which I find true of lobster too. Well, enough about me . . . It looks quite innocent here. Does damage in the garden? Most do. Would get eaten pronto in France although I don't know if that kind is edible .... Anyway, I love the black holes at the back ; they complete the vaguely sci-fi atmosphere. Very sci-fi. We don't get them often and they are a grey color. I understand a small bowl of beer is used in gardens to keep them from destroying plantings. Nicely done - a study in black and gray! 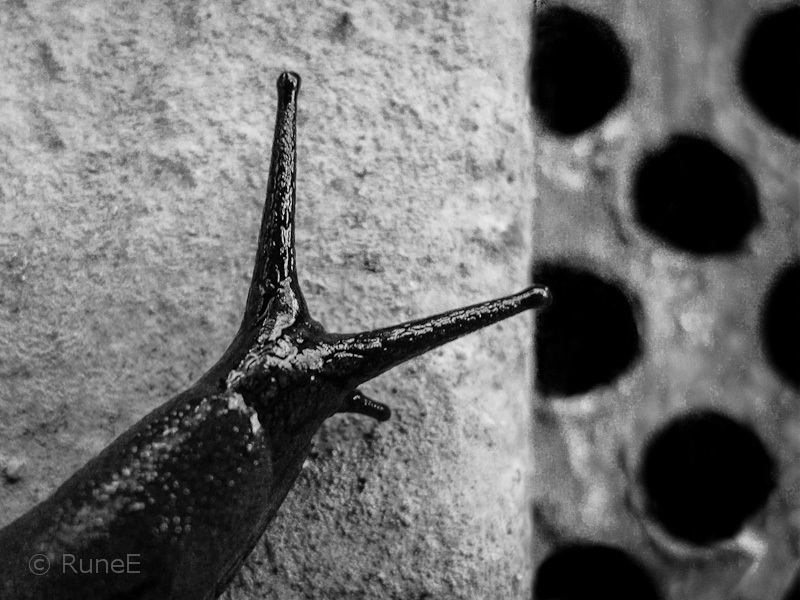 Ah, even snails can be intriguing and I do like your b&w capture, Rune, not many people can be creative with bugs! I've always known you were a talented gentleman!! Have a delightful weekend -- with or without the snails!! Great macro shot - I wouldn't hurt snails but I prefer it if they don't come into my garden and eat my plants! En god Anneklem etterlates til deg Rune. Jeg går en tur i haven hver aften i skumringen med en gammel saks, som jeg bruger til at klippe MASSER af dem ihjel med - HVER dag! Yikes, we don't have snails here in Oklahoma but we do have slugs. In the same family. Wonderfully and slimy - shot my friend. Great composition...I forgot all about the fact that this is a snail...and a great weekend to you, too! Aldri så galt at det ikke er godt for noe, sies det ... - flott bilde! Ugh, I hate the looks of snails,any kind of snails. This one looks pretty revolting to me. They looks a lot different than the snails I occaisionally see in our backyard. I haven't seen any for ages, maybe they don't like our 117 degree weather any better than I do. It wouldn't be so bad if the sun was shining through, but we have had nothing but cloud covering for the past few days and the weather is totally muggy. We are getting the monsoons from Arizona. Flott bilde av ein uvelkommen gjest her hos meg. Stilig bilde, men skrekk og gru ... de er noen ekle kryp. Og jeg er livredd de skal finne veien til min hage! Great composition turning the ordinary into the extraordinary. Looks more than a little sci-fi to me. 3 - 4 - 5 - THINK!